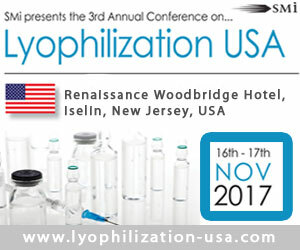 With the event now just 1 week away, I wanted to remind you that there is still time to secure your place at SMi’s 3rd annual event, Lyophilization USA, taking place on November 16th and 17th in Iselin, New Jersey. Are you looking to create a competitive edge, reduce manufacturing costs and shorten cycle time through understanding key parameters in pharmaceutical freeze-drying? Receive guidance on QbD submissions? Gain an overview of the latest innovations in freeze drying technology and protein stabilization? Increase product shelf life through unique insight into interaction with API’s? These will be just some of the questions answered through powerful keynote addresses delivered by our expert panel of speakers such as: Genentech, GSK Vaccines, Johnson & Johnson, Bayer Consumer Care, Tempris plus many more. Allergan | Arlenda | Celgene | Cellphire | Coriolis Pharma | Ellab Inc | Emergent BioSolutions Inc. | Explicat Pharma GmbH | Fujifilm Diosynth Biotechnologies | Janssen Pharmaceutical Company | KB Consulting | Lyophilization Technology Inc | Merck & Co. | Merck Research Laboratories | Regeneron Pharmaceuticals Inc | Pharmaceutical Packaging | Takeda | University of Kentucky | Urogen | Windtree Therapeutics, Inc.